You are here: Home / Blog / Knowledge Base / How to cancelling your Google Apps account? How to cancelling your Google Apps account? If you’ve decided that you don’t want to use G Suite with your domain anymore, you can cancel your subscription. To free up your domain within 24 hours, cancel all your subscriptions and delete your organization’s Google account. You won’t incur any G Suite subscription charges if you cancel your account before your trial runs out. If you’re billed on a monthly Flex plan, canceling your subscription immediately stops further billing for G Suite services. If G Suite is your only subscription, canceling your subscription also deletes all your user accounts and data, and frees up your domain within 24 hours for use with a new G Suite subscription. 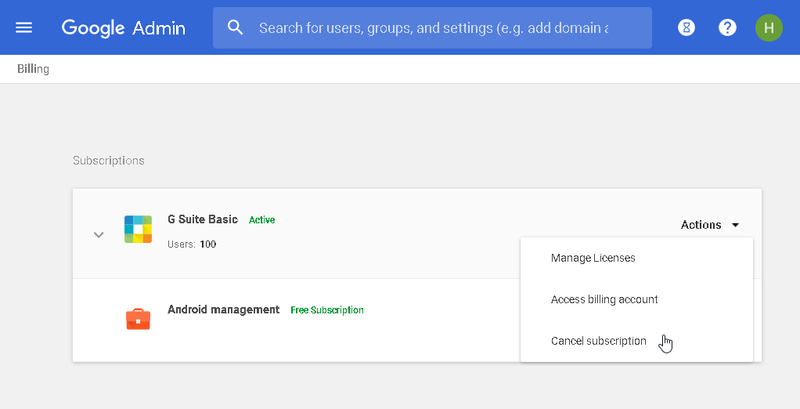 If you have other subscriptions in addition to G Suite—such as Cloud Identity or Chrome device management—you can cancel G Suite and keep your other subscriptions active, or delete all your subscriptions to free your domain for a new subscription. Save user data: When you cancel your G Suite subscription or delete your organization’s Google Account, all user accounts and associated G Suite data, such as Gmail messages, Google Calendar events, and files stored in Google Drive, are deleted. If you need to save user data, it needs to be downloaded before you delete your account. If you don’t want to save any user data, don’t worry—it’s automatically deleted when you delete your organization’s Google Account. Other types of Google data, such as YouTube channels, Google AdWords accounts, Play developer accounts, and other assets are also deleted when you cancel your G Suite subscription and delete your organization’s Google Account. To save data, make sure to transfer ownership of these assets before proceeding. For details, see Delete a user from your organization. If you have a Google Cloud Platform Organization, that Organization gets deleted when you delete your G Suite account. If you want to keep any Cloud Platform projects, you need to transfer ownership of the projects out of the Organization. See the Cloud Platform Help for more information. Save billing records: After you delete your organizational account, you won’t be able to access your billing records. You can download any invoices or billing records before you delete. Delete G Suite Marketplace apps: If G Suite is your only subscription and you’ve installed any G Suite Marketplace apps, you need to delete those apps before canceling any of your subscriptions. To check whether you have Marketplace apps installed: Sign in to your Google Admin console > Sign in using your administrator account (does not end in @gmail.com). > From the Admin console Home page, go to AppsMarketplace apps. Sign in to your Google Admin console. Sign in using your administrator account (does not end in @gmail.com). From the Admin console Home page, go to Billing. Under Subscriptions, find your G Suite subscription. Click Actions > Cancel subscription > Click Continue. After you cancel, Google will automatically charge your primary payment method at the start of the next month. If you’re on Flexible Plan (monthly), you’ll be charged on a prorated basis for this month’s usage. If you’re on Annual Plan, your cost for the remainder of your plan is shown on the next page. If you have multiple subscriptions and are only canceling G Suite, click Yes to complete cancellation. If G Suite is your only subscription, continue to the next step. Check the box to confirm that you’ve backed up your data and are ready to delete your account. Click Delete my domain to delete your organization’s Google Account. If G Suite is your only subscription, follow the instructions in Cancel your G Suite subscription above to automatically delete your organization’s Google account. If you have multiple subscriptions, follow the steps below to cancel all subscriptions and delete your Google’s organizational account. From the Admin console Home page, go to Company profile > Profile. Click Profile. Can’t sign in to the Admin console? If you can’t access the Google Admin console for a managed Google Account, such as G Suite or Cloud Identity, here’s what to do. “admin.google.com is for G Suite accounts only. Regular Gmail accounts cannot be used to sign in to admin.google.com”: If you get this error when signing in to your Admin console, you’re trying to sign in with a personal Gmail address (ends in @gmail.com). Instead, use an admin address associated with your managed Google Account. “You’ve reached a login page for a domain that isn’t using G Suite”: If you get this error when signing in to your Admin console, the managed Google Account you’re trying to sign in to has been deactivated or deleted. Wait 24 hours from the time your account was deleted. “Couldn’t find your Google Account“: If you get the above error when signing in to your Admin console, you’re trying to sign in to a managed Google Account that doesn’t exist or isn’t available. After completing the deletion steps. You can sign up the Google Apps Free edition at here to get the big savings on recurring expenses.